Rai’s Srinagar arrival is the outcome of a series of brainstorming sessions that took place at various levels with an objective to rediscover Kashmir as a place where the heritage, nature and the people co-exist. Those debates involving relevant experts was also prelude to the identification of different people who could help J&K implementing the upgrade of Jammu and Srinagar to smart cities. But her involvement with the Reshamkhana is an altogether a different story. After the September 2014 floods, the World Bank agreed to fund the Jhelum & Tawi Flood Recovery Project (JTFRP) to the tune of US $ 250 million (Rs 1600 crore). It envisages a US $ 15 million component for restoration and strengthening of livelihoods. Given the fact that entire Silk Factory premises remained inundated for around a fortnight, and its operations completely ceased, this deserved to get a priority. 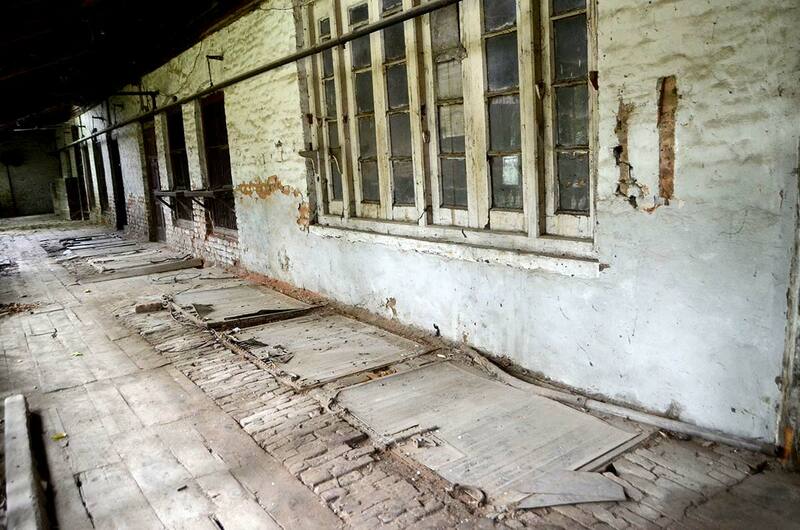 But when the World Bank saw the premises, part of which the J&K government wished to demolish and reconstruct was part of world’s biggest silk industry in 1942, it sought an expert opinion on its tangible and intangible heritage value. That is how Ms Rai was hired by the J&K Industries Ltd, a wholly owned State PSU, in dire straits for a long time now. 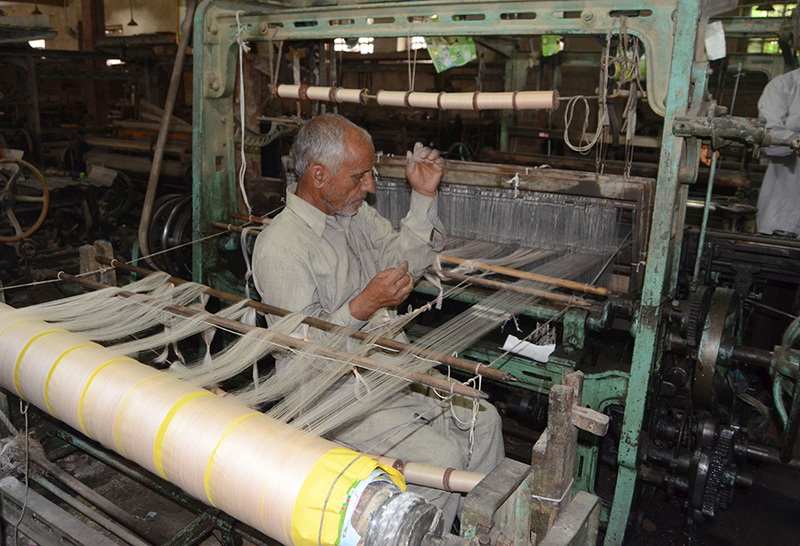 The Silk Factory is an important link in the cultural narrative of silk production of Kashmir. It’s technological and historical worth apart, the factory had immense social-economic value in Kashmir context. While World Bank might be concerned about the tangible part (building and machines), the intangible worth of the space by way of knowledge, processes, memories and collective connection to the past are things that Kashmir is so keen to preserve. 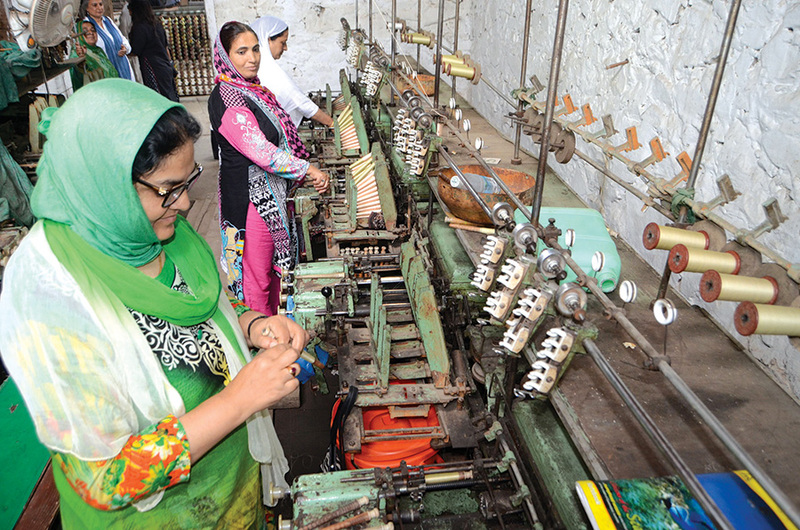 For places like Kashmir, where occupations have remained interlinked with the dark politics of the place, spaces silk Factory Rajbagh is a symbol of struggle and survival. Silk has played a peculiar see-saw in Kashmir economic abuse and political awakening, a history that new generation is so keen to protect and conserve. But Kashmir’s silken story is not as smooth as that of the silk it has produced for centuries. Silk is known to Kashmir for a long time, perhaps as early as Buddhist era. But there are not many pieces of evidence other than the mulberry trees. Offering a chronological sequence about the silk, G M Sofi in his magnum opus, Kashir Being A History Of Kashmir, has recorded Mirza Haider Duglat (1541-51) witnessing mulberry trees cultivated for silkworms when he seized the throne for a decade. Mughal historian Abul Fazl recorded mulberry being “little eaten” but its foliage “reserved for the silkworm” hatched from eggs imported from Little Tibet and Gilgit. Mughals had attempted organising the sector but there are no records. During highly exploitative Sikh rule, there are conflicting records about the abundance of silk. While William Moorcroft saying it was sufficient for local consumption, T G Vigne insisted it was being purchased by the governor in barter for rice and other things and eventually exported to Punjab. With Ranbir Singh in control, by 1870, dubar had two Bengali experts, trained from Murshidabad, implementing silk reeling factories: one each at Cherpur (Islamabad) and Haft Chinar, ready in 1874. These twin factories were Murshidabad factories, Sofi recorded. Third came up at Raghunathpur near Nasim Bagh and locally it was called Behrampur factory. Sir Walter Lawrance, who moved into Kashmir folklore as Settlement Commissioner, was part of durbar’s silk revival process which he has mentioned in The Valley of Kashmir. After importing machinery from Europe, Ranbir Singh created the vast network of Kiram Kash (people rearing silkworms), gave them absolute rights over mulberry trees and an authority to even use the space of their neighbours at will for worm rearing. Eventually, they became informers of the government and the silkworm economy revived through questionable means. “The whole business was too official, and the general public looked upon it with hatred or disgust,” Lawrence recorded. By 1869, 127 buildings were officially built for cocoon rearing. In 1878 the entire population of silkworms was devoured by the outbreak of Pebrine, allegedly set off by the Japanese seeds. It sunk to a level that by 1890 when Lawrence was associated with silk, only two cocoon rearing buildings had survived at Raghunathpore and Cherpur. By then, durbar had decreed to be the sole collector of cocoons woven by the moths in wild. Then, in 1894, he entrusted Signor Bassi, an Italian wine maker, to take care of the revival of the sector with the help of chief judge Babu Nilamber Mukherji. Only Kothar belt, down south, had survived as the repository of the silk moth. But the sector did not die, thanks to a robust demand in London and France. It revived because of the market. And the credit goes to Sir Thomas Wardle (1831-1909), one of the famous British silk businessman and expert. His intervention into Kashmir silk coincided with the British Resident Colonel Nisbet reducing Partap Singh to a second class sovereign. There was some correspondence going on between the Resident and Wardle since June 1889. “There is not the slightest doubt that it might be the foundation of a large and remunerative industry, and with such a beautiful climate as Kashmir is favoured, it seems to me that it would add to the immense usefulness of India to us and to herself if Kashmir could be made to supply us, and also France, with such beautiful silk,” Wardle wrote to the Resident on Dec 5, 1890 after receiving some sample raw silk. “I have a deep conviction that the future of the silk industry in Kashmir will be of great importance, and that if the Maharajah of Kashmir thinks favourably of the idea, Kashmir may soon become one of the great centres in the world for sericulture,” he wrote to Sir George Birwood, a senior bureaucrat in British India, on February 21, 1891 after receiving eight pounds of raw silk in London. It was manufactured into brocades by Messer, Warner & Sons, of Spitalfields and Braintree, and exhibited at the Stafford House Silk Exhibition in 1894. The Queen and the prince and princess of whales evinced much interest into the manufacture, Wardle recorded in his book Kashmir: Its New Silk Industry. The first major consignment to London from “sericultural country” landed in London on January 26, 1896. It comprised 16 bales of raw silk. That marked restart of the revival with Birdwood deputing Assistant Resident in Srinagar Chenevix-Trench to accompany Wardle to France and Italy for purchasing eggs and cocoon reeling machinery in 1896. A year later, Wardle recommendation led to the appointment of C B Walton as Director Sericulture. The consumption of seeds shot up from an import worth 600 pounds in 1896 to 1500 in 1898 and 3040 pounds in 1899. By 1901, Kashmir required 25000 ounces of seed for 6000 registered Kiram Kash families. Soon Wardle was in Srinagar supervising implementation of necessary machinery from reeling to spinning. When in 1903, he left for home, six of the 10 Filatures were up and running, every one 435 ft long and 42 ft wide and having 212 basins each, in two rows. These six Filatures cost durbar 28000 pounds. But the outcome was rewarding. In 1903, Kashmir had 44000 cocoon rearers. “There are 550 men and boys in each Filature, a sight perhaps unequaled in Europe,” a satisfied Wardle recorded. By May 1903, two Filatures were filled with 1350 women, by then, the highest ever employment to women. Kashmir produced 18.8 lakh pounds of raw silk, a record of sorts. Durbar appointed Messrs Durant, Bevan and Co, as the sole silk broker in London with a brokerage of one percent. In three years durbar had a profit of 40,000 pounds. But British bureaucracy was unhappy with durbar. Knowing the blood sucking family, they wanted the silk sector should be privatised. Wardle met Maharaja and his brother Amar Singh at Jammu and got their mind. They were opposed to any privatisation plan and Wardle was also supportive of it. But bureaucracy had sent the case to Lord Curzon forcing Wardle to write to him and advice him against signing it. He obliged Wardle who wanted it to survive as state industry. “I hope it may permanently so continue,” Wardle recorded. Wardle’s memoir records interesting incidents in the entire revival process. Resident, for instance, had asked him to purchase only four machines in Italy. But when he went shopping he found it available in a battery of six machines. He wrote to the Resident that his asking for two machines “raises suspicions of the purchaser having some sinister intention”. Eventually, he purchased nine. When he wished to dispatch nine boxes of eggs, the supplier found no postal agreement between Italy and Kashmir government, so they utilised Swiss services! With big monies moving to family coffers, durbar had many plans. A 300-basin Filature was proposed to be set up in Islamabad, to be run by steam or hydropower. Though the tramway connecting the river Jhelum near Lal Mundi to the Solina mills was damaged by floods and was repaired, the government wanted to make fuel-movement cheaper. So the plan was to get Doodganga slightly closer to the Filatures. An agreement was reached with Rawalpindi based transporter Hari Ram to create a special cart fleet for exclusive use of transporting silk products out of Kashmir. 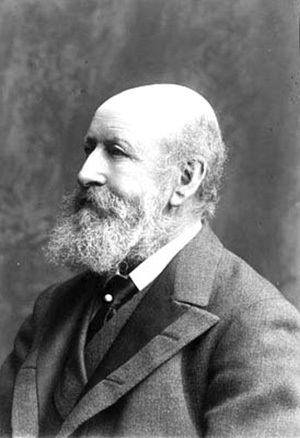 Wardle died in 1909 after giving Kashmir world’s biggest silk factory. The initiative helped more than 50,000 people to fight hunger. Durbar filled coffers but Kashmir paid a huge cost. The best reelers in Kashmir, Wardle said, was available at 4 annas a day, an amount that made it three times cheaper in comparison to France. The feeling of being exploited had started accumulating from the very start. On March 20, 1920, the silk factory workers, usually referred as labourers in official records, went to heir apparent Hari Singh and submitted a representation seeking hike in the daily rate. Nothing happened so the tensions remained simmering. On July 19, 1924, when workers sought axing of a clerk who was running a protection racket, the Silk Factory mangers informed the police that the labourers have gone out of control. Next morning, the army moved and surrounded the factory. They arrested 25 people, apparently the ring leaders. Four of them were retained at the police station as all others moved to Central Jail. On July 21, when nearly 4000 workers of the factory started a protest outside the Sherghari police station, police opened fire killing 10 workers on the spot as 20 survived injured. Durbar wanted to give the protest a communal colour but Resident Sir John Barry Wood refused to take it. On his suggestion, durbar appointed a local educated Muslim Hakim Ali in the management in 1930 who eventually became the director of Sericulture later. But historian believes that the July 1924 had laid the basis for the freedom movement. It was in its aftermath that the educated Kashmiris started sending representations to the British India government. Dubar continued investing in the sector. 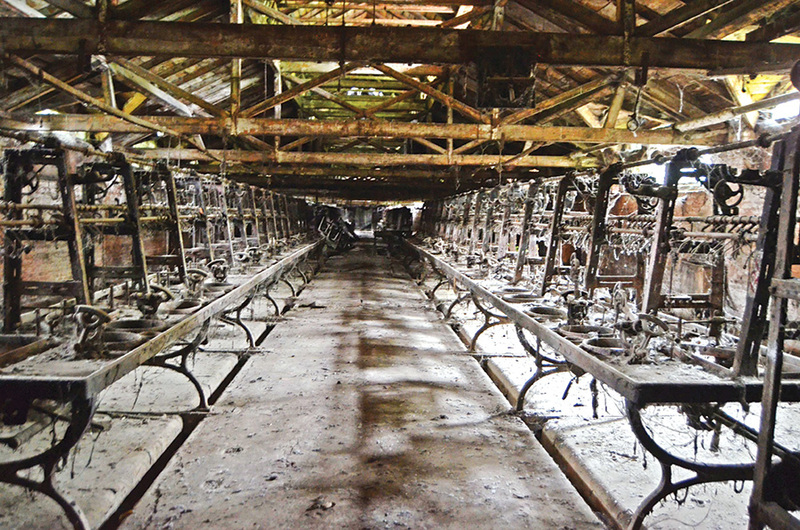 In 1938, a major conflagration devoured most of the silk factories in Solina, that was completely handloom. There were similar fires, albeit small, in 1907 and 1913 also. A year later, Hari Singh had invested in a new facility in Rajbagh envisaging the facilities of throwing, warping, weaving, and finishing of silk. Set up over sprawling 114 kanals of land, there were 130 looms in operation with a monthly output of 20,000 meters of silk. It went into operation in 1942. Since then, the two campuses were supplementing each other to retain the status of world’s biggest silk factory. Reeling was taking place in Solina up to the level of yarn making and the spinning and weaving processes were taking place in Rajbagh. Then the September 2014 floods inundated Rajbagh for 27 days, reducing most of the machines to mere junk. Right now when the process is on to get the World Bank help in silk revival, Kashmir is back to the silk route debate, courtesy China Pakistan Economic Corridor (CPEC). With Kashmir sitting on the head of the corridor, barely 250 km away from Srinagar, the tensions are running high in the Sino-Indian newspapers. The track passes through the Kashmir territory, literally, the Gilgit. India has not joined the One Belt One Road but it will eventually have no other option. But will its joining lead to some forward movement on Kashmir or will end up further militarisation of Kashmir, remains to be seen. Beijing is going ballistic in its commentary against India, even going to the extent of exhibiting its willingness to be a surrogate invader at Islamabad’s behest, is the new diplomatic headache for the region. NSA Ajit Doval has flown to Beijing and it is too early to say if Kashmir silk can have some access to the twenty-first-century silk route. But when is Kashmir weaving its silk again? 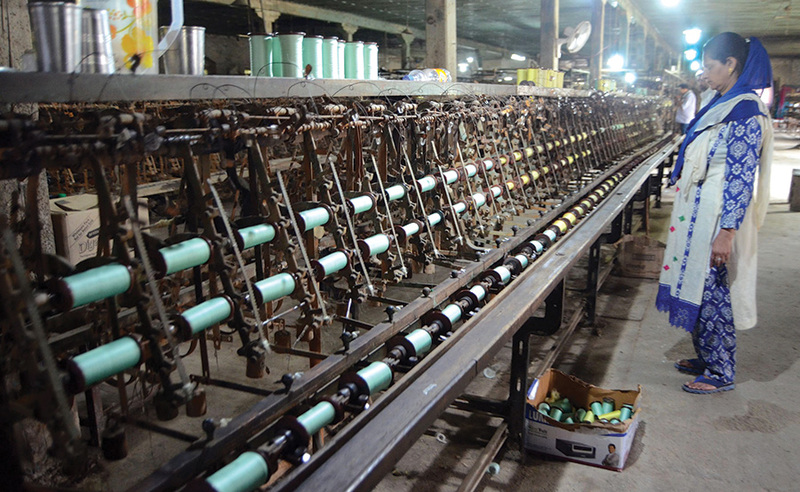 “Right now, we weave around 2000 meters a month,” an official of the Silk Factory said. “There is a massive market but we lack machines and the human resource.” With the Filatures locked for a long time now, they procure their silk from open source. They produce a very limited quantity of Chiffon, Chinon, Charmeuse Satin, Crepe, Habutai, and Satin. The fact is the silk has faded away in the priority list of the society and the governance structure. Kashmir has 400 thousand mulberry trees, spread over 963 acres of land and cocoon production on 2014-15 was 403 metric tons. With a raw silk production of 138 metric tons, it is already the No 5 in ranking within India. The number of Kiram Kash has fallen to an all time low to 9600, who require not more than 8772 ounces of seed a year. Of the 17 reeling units in private sector, only six are running. There are 12 silk weaving units, albeit small. The overall turnover is estimated at around Rs 20 crore. Both the principle silk premises are in a state of mess. By 1947, the Filature at Solina was processing one million kilograms of cocoons with Wardle purchased Italian basins. 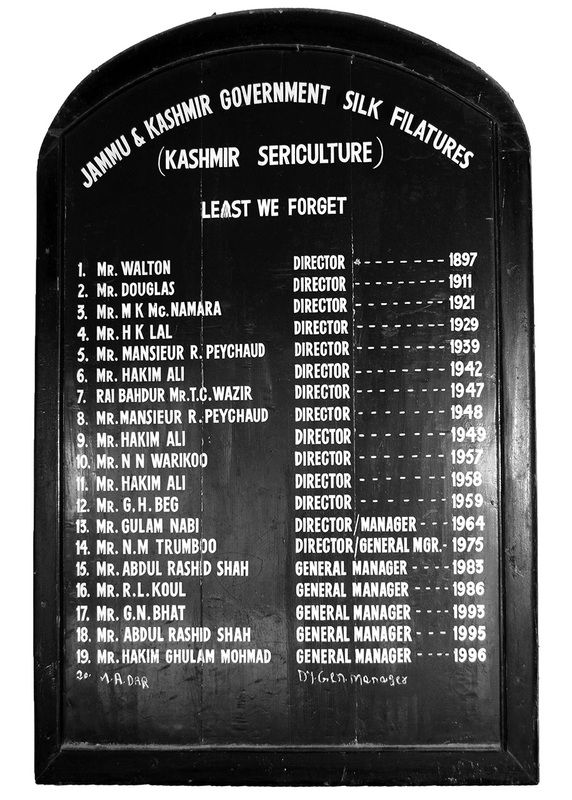 In 1963, the government transferred it to J&K Industries though the department of Sericulture continued supplying it the raw material till 1972. Soon after, it was asked to procure its raw material from the market and then on September 15, 1988, the state cabinet de-monopolised silk industry. That is being said to be the deadliest blow to the Filatures. The yarn production fell from 339 thousand kilograms in 1987 to less than 19 thousand in 1998. In 1999, World Bank agreed to fund reinstallation of reeling basins. With the help of central silk board, they are installed. 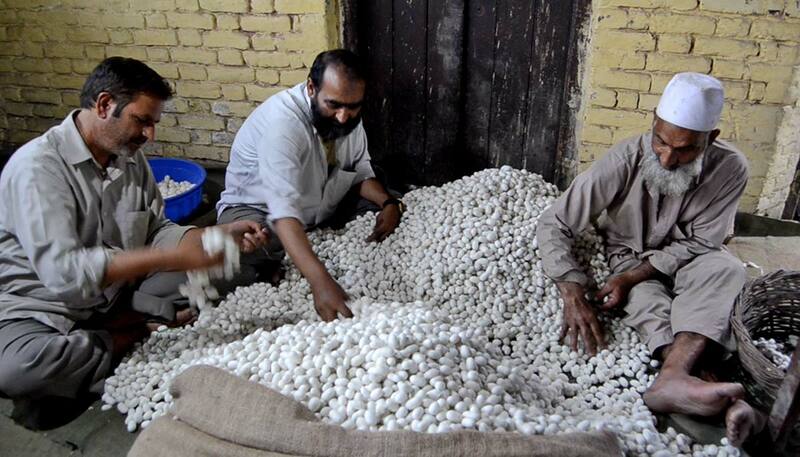 Recently, the managers procured 300 kgs of cocoons and plans are afoot to make a fresh start soon. 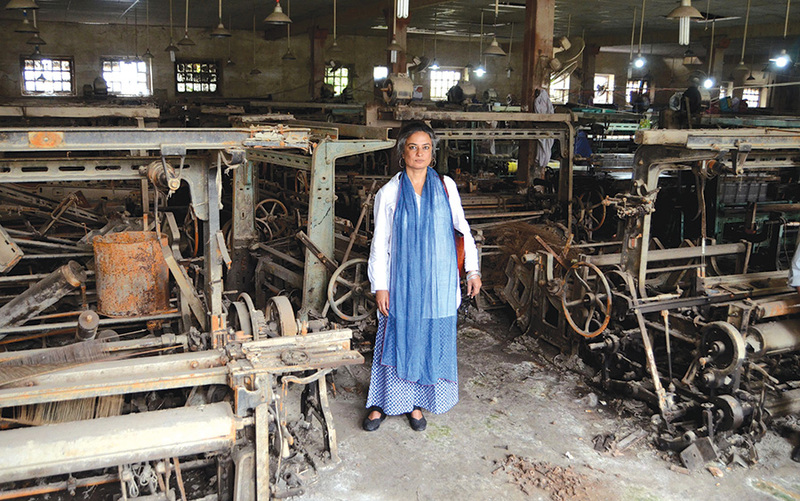 “The Filature at Solina closed its operations and continues to exist as a complex of buildings of significance to the narrative of the industrial heritage of Kashmir,” Ms Rai’s report said. From a few thousand workers at the start of militancy, that also coincided with the failure of a World Bank aided sericulture project from taking off, the number has reduced to less than 20, mostly watch and ward. Sir Thomas Wardle: The real founder of the silk industry in Kashmir. The sister concern at Rajbagh started facing a serious yarn crisis. It had taken off in 1939 with used machinery that was salvaged half burnt in Solina. In 1960, some 17 used Japanese looms had been installed with the only upgrade reported in 2011 when a few winding machines were purchased from Ahmedabad. This entire machinery remained under 17 ft floodwater for 27 days. Since the number of workers had gone down from around 1000 to less than 100, those still reporting to their duties jumped into flood sludge, salvaged some of the looms for around two months and resumed work on 17 looms. Ms Rai says this could be the only instance in the world where workers are effectively using machines belonging to 1930s, may be older. “It is testimonies to their skills, technical know-how and resilience that they can operate machinery that goes back to the 1930s,” the report said. But the symbolic survival has come at a huge cost. Not able to earn for the salary of its staff, JKI started selling the family silver literally. From the Solina premises, perhaps the only green open space available in Srinagar with almost 100 Chinars around, JKI had sold six acres of prime land to various departments. The last public intervention forcing the government to invite experts for conserving the premises was the outcome of a photograph when the power department was demolishing a heritage building to make room for power transformer repairing workshop. 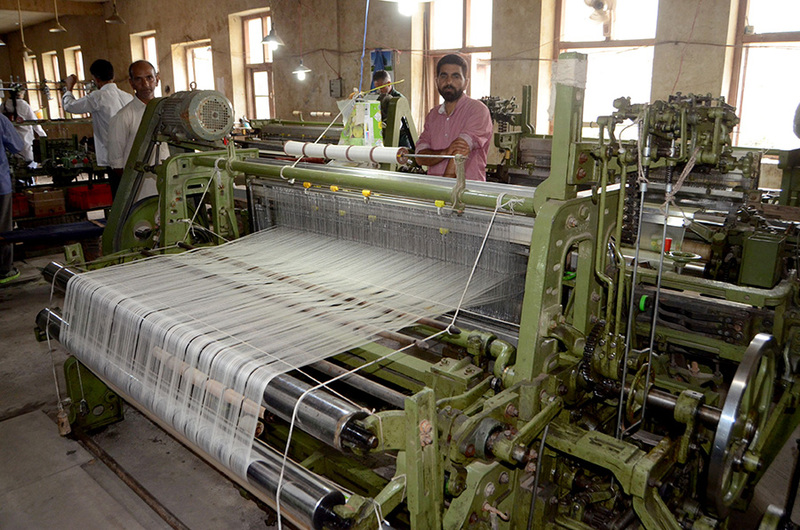 The silk factory is now shrunken to around 23 kanals of land as JKI has sold most of the factory land to various departments including to an engineering wing, Income Tax Department, Passport Office and state power Development Corporation. Cocoon farmers crisis is that they sell more than 60 percent to non-local buyers and it is invariably distress sale! Unmaking of sericulture has led Kashmir to lose nearly three lakh jobs. This process killed the massive cooperative handloom weavers movement that was consuming huge yarn produced at the Filatures. One major factory was working till recently when the Health authorities took that over for setting up the Dental Hospital near SMHS. Now when Ms Rai has drafted a clear plan for the restoration of the Rajbagh factory, is there a possibility of reviving the two spaces? Officials say they are so keen to reintegrate the two spaces and rediscover the pristine glory of the silk. If that happens, Solina can have a design school, a silk museum, a lot of green space, some manufacturing and space for cocoon auction. “The idea is to conserve a space so that it becomes a model way of approaching smart city concept,” one official admitted. But will it get Kashmir its “Sericultural Country” back? Silken Solina: Why Should Employees Be Housed After Ruining A Heritage?